This week has seen the very first jailbreak released for the new iOS 8 – 8.1 firmware, and whereas, ordinarily, the process of using a jailbreak tool is fairly simple to the end user, the decision of Chinese team Pangu to roll its exploit out so early has left a trail of compatibility issues. Fortunately Saurik, the guy behind Cydia among a number of other integral jailbreak services, has been hard at work in making the required adjustments, and having brought Cydia and Substrate up to speed, has now released an updated version of AFC2. 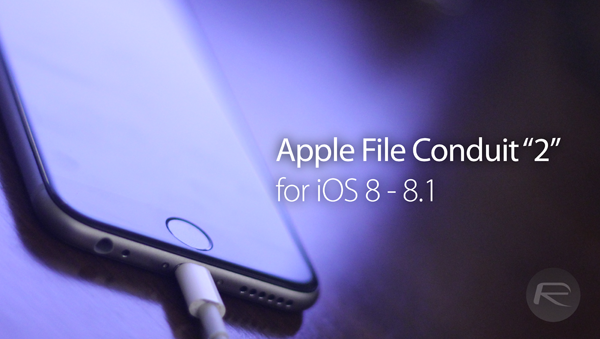 In a nutshell, AFC2 – Apple File Conduit “2” – allows users to access a full iOS file system via USB connection, and while there have been some reservations from a security aspect, Saurik notes that root file information will only be divulged to computers marked as trusted. At present, authors of jailbreak tweaks seem to be working overtime alongside Saurik to ensure that iOS 8 jailbreakers can indulge, and while many of our favorite tweaks remain in the wilderness for the time being, it shouldn’t be long until all of our favorites are deemed ready for prime time. We knew that Pangu was working on a jailbreak for iOS 8, but given that the new firmware has been around for a matter of weeks, we didn’t perhaps expect it to arrive so promptly. Not that we’re complaining though, and with Cydia, Substrate and AFC2 now sufficiently prepared for all devices running iOS 8, the onus will now be on Apple to plug the exploits. In the meantime, if you wish to access your root file system, be sure to snap up the AFC2 package from Cydia, which, as you might expect, is completely free of charge. For a full tutorial on how to use AFC2, simply follow our previous detailed guide on it here. Oh, and if you have yet to jailbreak but wish to learn of the steps involved, be sure to check out our concise, step-by-step tutorials that will help you get started. Great news. I can only hope this means they are working on a repackaged version of the Jailbreak tool that will install all these dependencies by default…AND before Apple releases an update. I installed this and my phone went into that Apple logo boot loop… Grrr… Had to restore etc. I had no tweaks installed from Cydia either which is more annoying!! But if i want to use ifunbox to access raw file system and stuff, i need afc2 which is ( ironically ) i need to install it first via cydia. when I install this app my iphone 6 plus gets stuck at the apple logo after respringing. Where am I going wrong? Did you do a OTA update or did you update through itunes? OTA updates wont work! no, I originally update OTA but after getting stuck at the apple logo after respringing after installation of this package, I had to do a DFU restore in itunes. Then when I tried to install this again it got stuck at the apple logo again. Does anybody have any ideas for a fix? Go to ifunbox, Quicktool box and click USB tunnel, then open Winscp and type 127.0.0.1 then root and the password alpine and you’ll be able to connect your pc with the root files of your iPhone, I did that because my wifi if grayed-out.